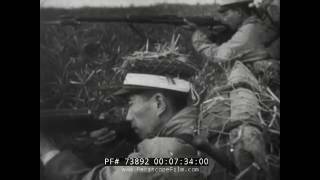 ww2dbaseThe Second Battle of Shanghai, known in Chinese as Battle of Songhu, was the first major engagement in the Second Sino-Japanese War. General Zhang Zhizhong was the commanding officer in charge of the defense of the region, and for some time had been training men for such an attack. He established several defensive lines under the guidance of German military advisers; the construction was able to be completed prior to the battle, but very few units were actually instructed on how the fortifications were to be used in various situations. ww2dbaseThe Nationalist Chinese leader Chiang Kaishek had been focused in northern China, and in fact had pulled troops from the Shanghai region to counter Japanese advances to the north. He believed that while the Japanese wanted Shanghai, since it was the Japanese Army leadership that had been planning this war, the Japanese would likely take a land route marching from north to south (and not by a amphibious landing which would require support from the Japanese Navy), and he was correct in his determination. In Moscow, Russia, however, Soviet Union (USSR) leader Joseph Stalin had a different design for the short term. He wanted to expand the Second Sino-Japanese War as quickly as possible in order to mire the Japanese Army in the vast Chinese interior, thus reducing the chance that Japan could divert its resources to attack Russia. Through the 1930s, USSR had been planting agents in China, and what Chiang did not know was that Zhang Zhizhong was among them. To Chiang Kaishek, Shanghai was strategically important, for it guarded the mouth of the Yangtze River, upstream of which lay the capital city Nanjing, and it was a major industrial center. Chiang's first attempt at safeguarding this city was to prevent the war from escalating to that location. Stalin, however, ordered the opposite, demanding Zhang to provoke the Japanese. Obeying Stalin's orders, Zhang repeatedly sent Chiang plans for invasions into the Japanese zone in Shanghai, which was guarded by only 300 Special Naval Landing Forces troops with no sign of being reinforced in the future. Chiang rejected every request, and Zhang knew that the only way to achieve his orders from Moscow was to create a situation in which the Japanese would fire the first shot, so that he could advance without disobeying Chiang's orders. ww2dbaseOn 9 Aug, First Lieutenant Isao Oyama of the Japanese Naval Special Landing Forces attempted to enter the grounds of the Hungchiao Airport in Shanghai, which was illegal under the terms of the 1932 ceasefire at the end of the first Shanghai battle. Oyama was fired upon by Chinese policemen and was killed. The next day, Japanese consul general in Shanghai publicly apologized for Oyama's action, but demanded the Chinese police force, the Peace Preservation Corps, to disarm. While this demand was obviously a pretext in preparation for the Japanese Army troops marching southward from the Beiping area, it also gave Zhang the perfect opportunity to move in to clash with the Japanese. In Nanjing, Japanese and Chinese representatives met, with the Japanese demanding all Chinese troops as well as the Peace Preservation Corps be removed from Shanghai, and the Chinese refusing to meet this demand. The continued clashes in Shanghai prompted Japan in dispatching reinforcements to Shanghai, and with this intelligence, Zhang finally was able to convince Chiang to order troops to match for Shanghai on 11 Aug.
ww2dbaseOn 12 Aug, western powers convened in an attempt to broker peace. The western powers' main motivation was not to prevent an escalation of war, but instead they simply wished to protect their industrial and commercial interests in the city. None of these attempts succeeded. ww2dbaseAt 0900 hours on 13 Aug, more than 10,000 Japanese troops entered the suburbs of Shanghai, and engagements broke out in Zhabei, Wusong, and Jiangwan districts. In the mid-afternoon, Chinese regulars of the 88th Division began attacking advancing Japanese troops with mortar. At 1600 hours that day, ships of the Japanese 3rd Fleet in the Huangpu and Yangtze Rivers began bombarding the city with naval guns. On 14 Aug, Chinese aircraft began bombing Japanese positions, followed by the issuance of the Proclamation of Self-Defense and War of Resistance from Chiang's Nationalist government. A counterattack on the ground by Chinese troops commenced at 1500 hours, but with the Japanese heavily fortified in the international zone, the lightly-armed Chinese counterattack failed. On 16 Aug, Zhang changed his strategy. Instead of persisting on the counterattack, he began instructing his men to engage in a style of fighting characterized by sneaking up to Japanese-held buildings and set the building ablaze by torches or grenades. When the Japanese troops fled the building, well-placed Chinese machine guns would strike down the fleeing men. On 17 Aug, the deployment Japanese light tanks drove back the Chinese troops and ended the counterattack. Zhang was heavily criticized by Chiang for the inability to penetrate Japanese lines, especially with the kind of heavy casualty numbers he was experiencing. Chiang would slowly take on more direct responsibilities for Shanghai's defense, eventually personally assuming the role of the overall commander. ww2dbaseMeanwhile, Japanese aircraft from Taiwan bombed the city beginning on 14 Aug. The civilian who had not left the city now fled in waves, creating further chaos. ww2dbaseThe Japanese bombings on Shanghai were challenged by Captain Gao Zhihang's 4th Flying Group, shooting down six Japanese aircraft while suffering no casualties. 14 Aug was announced Air Force Day as an instrument of morale bolstering. Nevertheless, Chinese aircraft were few in number, and lacked proper replacement parts for repairs. By the end of the campaign, even though the Chinese aircraft shot down 85 Japanese aircraft and sank 51 ships, the 91 losses suffered by the Chinese represented nearly half of China's total available combat aircraft. ww2dbaseDespite the valiant effort of Chinese pilots, Shanghai still suffered from Japanese aerial attacks. Tens of thousands of civilians died as a direct result of the bombings. ww2dbaseOn 18 Aug, Chinese reinforcements in the form of the 36th Division arrived and attacked the docks at Hueishan. The 36th Division's attack was coordinated with a counterattack by the 87th Division at Yangshupu to assert maximum pressure on Japanese troops. Supported by tanks, the 36th Division drove off the Japanese defenders at Hueishan, but the lack of tank-infantry coordination quickly led to the loss of the docks once again. The attack eventually failed with the Chinese losing 90 officers and over 1,000 men. ww2dbaseMoored in Shanghai's ports, American cruiser Augusta observed the Japanese aggression while her Marine detachment guarded American interests in the city's international zone. Though neutral, Augusta came under accidental Chinese aerial attack; fortunately for the men of USS Augusta, the attack was only a near-miss. Large American flags were painted atop the three main batteries to prevent further mistakes. Nevertheless, she still received casualties when Chinese anti-aircraft shells came down on her on 20 Aug. These incidences, though accidental, strained Sino-American relationship. Augusta remained in Shanghai until 6 Jan 1938.
ww2dbaseOn 22 Aug, the Japanese reinforced the city as well, landing General Iwane Matsui's 3rd, 8th, and 11th Divisions at Chuanshakou, Shizilin, and Baoshan 50 kilometers northeast of Shanghai under the cover of naval guns. The landing drew out some Chinese troops from the city, but naval bombardment prevented the Chinese troops from disrupting the landing. The Chinese forces, instead, set up a line of defense at the Lotien-Shuangtsaoten section of a major railroad network by 11 Sep. At Chiang's urging, the outgunned Chinese troops prepared for the upcoming assault by the better-trained Japanese troops. General Li Zongren advised Chiang to only make limited engagements and preserve the army's strength for a future confrontation further inland where the Chinese could fight on more favorable terms. Chiang refused, for reasons that will be discussed below in the conclusion. Generals Zhang Zhizhong and Zhang Fakui led the 50,000 Chinese troops in the Shanghai area. ww2dbase"More than two thirds of my 15,000 soldiers died within the initial stages of the battle for Shanghai," commander of the 36th Division Sun Yuanliang said. ww2dbaseOn 23 Aug, Matsui made another large-scale landing at Liuhe, Wusong, and Chuanshakou. The Chinese 18th Division under the command of Chen Cheng attempted to counter the new wave of Japanese landings, but again failed under the firepower of Japanese naval gun support. He turned to the tactic of night attacks, which was successful in overtaking several villages, but only to lose them again when daylight broke. Toward the end of Aug, remnants of the Chinese 98th Division was completely wiped out in defense of enveloped Baoshan; only one Chinese soldier survived the siege. ww2dbaseOn 12 Sep, Chinese representatives requested League of Nations intervention, but the League failed to react in any manner significant enough to make a difference. From this point on, Chiang looked toward the Americans, hoping that the United States would gather international support for China. Chiang continued to order his field commanders to hold on to Shanghai for as long as possible at any cost, waiting for some kind of action in the international diplomatic theater. ww2dbaseJiangyin was situation 100 kilometers northwest of Shanghai, sitting just inside the mouth of the Yangtze River. To prevent the Japanese from dispatching major warships into the Yangtze River, Secretary of the Navy Chen Shaokuan ordered a blockade on 7 Aug at the town of Jiangyin, Jiangsu Province. A force of five light cruisers and one training cruiser arrived at Jiangyin on 11 Aug. Between 11 Aug and 25 Aug, 43 military ships and 185 civilian vessels were sunk in the navigation ways at Jiangyin to block the Japanese from sailing up the Yangtze River, while minelayers deployed mines beyond the mouth of the river. The Chinese named Liu Xing as the commanding officer of all defenses at Jiangyin with direct command over the First Fleet (light cruisers Ninghai, Pinghai, and Yixian and training cruiser Yingrui); the Second Fleet was placed under the command of Ouyang Ge (destroyer Jiankang, gunboat Chuyou, and others), which was dispatched much further up river toward the capital city of Nanjing. ww2dbaseHaving learned the trap that the Chinese had established from pro-Japanese elements among the Chinese leadership and having confirmed via aerial reconnaissance, Admiral Kiyoshi Hasegawa of the 3rd Fleet ordered the Chinese defenses at the Jiangyin area to be softened by aerial bombing with both carrier as well as ground-based aircraft. The first major Chinese loss occured on 23 Aug when light cruisers Ninghai and Pinghai were sunk by aerial attack in shallow water (which allowed them to be floated by the Japanese later), followed by the loss of 8 further military vessels through 23 Oct 1937. The Chinese Navy was able to recover some of the naval guns from the sunken ships for deployment ashore as coastal batteries, thus changing tactics though still upholding the strategy of holding this key port town to prevent Japanese fail sailing up the Yangtze River. Only one battery, however, was successfully established; this battery, at Wushan, sank two Japanese vessels on 30 Oct 1937.
ww2dbaseOn 11 Sep, under the advice of Chiang's German advisor Alexander von Falkenhausen, 300,000 Chinese troops dug in at Luodian, a town in the suburbs of Shanghai that was strategically important as a transportation center. With artillery, tanks, naval support, and aerial support, 100,000 Japanese troops attacked Luodian shortly after. Despite the overwhelming firepower, Chinese troops fought on stubbornly. Defending in depth, the frontlines were manned with a minimal number of men while the rest of the forces were held in reserve, charging forward only when the artillery fire and naval bombardment ceased and the Japanese ground troops charged forth. Nevertheless, Chinese casualty rate reached 50%, and fled on 15 Sep when Luodian simply could no longer be held effectively. ww2dbaseCrossing the Yunzaobin River south of Luodian, freshly reinforced with men from Japan and Taiwan, the Japanese troops aimed to take the town of Dachang, which acted as Chinese Army's communications hub. Should Dachang fall, flanks of Chinese troops in eastern parts of Shanghai would also become exposed, adding even greater importance to the suburban town. Bitter fighting quickly turned into a battle of attrition, which was especially difficult on the Chinese forces, whose Stalingrad-esque suicide charges against machine gun nests and artillery placements were the only way to challenge Japanese superior firepower. On 17 Oct, however, things were a little brighter for the Chinese with the arrival of the Guanxi Army under Li Zongren and Bai Chongxi. A Chinese counterattack was soon orchestrated, though it was conducted poorly and was quickly driven back. Dachang fell under Japanese control on 25 Oct.
ww2dbaseWith Dachang lost, Chinese troops began withdrawing from parts of Shanghai. ww2dbaseWhile troops began to retreat from the areas north of the international settlement, Chiang knew that westerners were still observing from the international zone immediate across the Suzhou River. To make sure China remains on the forefront of the world stage, he ordered the Chinese 88th Division to defend an area on the north bank of the Suzhou River which contained the Sihang Warehouse, hoping that western observers from across the river would send news and photographs back to their home countries, and hoping that these news and photographs would trigger international condemnation of Japanese aggression at the upcoming Brussels conference scheduled to take place on 6 Nov 1937. However, the plan to leave men behind was vehemently opposed by Sun Yuanliang, the commander of the 88th Division. Unable to dissuade Chiang yet unwilling to disobey his orders, Sun and his superior Gu Zhutong decided to leave a single battalion behind as token defense which would fulfill Chiang's wish for a demonstration for the western observers. "It would achieve the same purpose no matter how many people we sacrifice", said Sun. As the result, 414 officers and men of the 524th Regiment of the Chinese 88th Division was left behind to guard the warehouse, commanded by Xie Jinyuan who volunteered for the duty; most of the men were recent transfers from the 1st Battalion of the 5th Regiment from the Hubei Provincial Garrison. For deception, Xie released the false information that 800 men were guarding the warehouse, instead of the actual number of 414, in order to confuse the Japanese; this would later lead to the popular belief that "800 heroes" defended the building. ww2dbaseAt 2200 on 26 Oct, the Chinese 524th Regiment withdrew from Shanghai North Railway Station into the Sihang Warehouse. The warehouse was a six-story concrete building with a small footprint that was just recently used as the 88th Division headquarters, with ample stocks of food, medical supplies, and ammunition. Each Chinese soldier was assigned a German Gewehr 88 or Gewehr 98 rifle, and a total of 27 light machine guns were available to the defenders. ww2dbaseMoving toward the Sihang Warehouse were troops of General Iwane Matsui's 3rd Division. With access to Type 94 tankettes and Type 89 mortars, the Japanese wielded far greater firepower. ww2dbaseAfter taking Shanghai North Railway Station in the morning of 27 Oct, the Japanese troops moved into the vicinity of the warehouse by that afternoon. The first engagement took place at 1400 when a Chinese reconnaissance team exchanged fire with around 50 Japanese soldiers. The first assault on the warehouse took place shortly after 1400 hours from the west, and was ineffective. Japanese troops set fire to the northwestern corner of the warehouse, but it was extinguished by 1700 hours. After the first day of action, two Chinese were killed with four wounded. The Chinese reported seven Japanese killed and about 20 wounded. Through the night Chinese troops repaired and constructed fortifications at and near the warehouse. To avoid provoking international incidents, the Japanese decided against bombarding the warehouse with mortar, fearful that stray mortar shells might land in the international zone south of the warehouse. Aerial bombing was likewise avoided. ww2dbaseOn the second day, 28 Oct 1937, another assault from the west was mounted at about 1500 hours while light field artillery bombarded the northern face of the warehouse. The attack was once again driven back. Elsewhere, Japanese troops found the electric wires and the water pipes leading into the warehouse, and promptly cut them. During the night of 28-29 Oct, trucks came in to resupply the warehouse; three soldiers were killed by Japanese snipers while unloading the supplies; the supplies were donated by Shanghai civilians. Meanwhile, ten wounded Chinese soldiers were given permission by British officers to be evacuated through the international zone. ww2dbaseIn the morning of 29 Oct, a 12-foot-wide Chinese flag was raised atop the warehouse, which became a source of inspiration for the defenders and the Chinese citizens in the city alike. The flag was sneaked into the warehouse overnight by girl scout Yang Huimin. At noon on 29 Oct, the Japanese attacked all three sides of the warehouse simultaneously with artillery and tankettes. A small group of Japanese troops tried to scale the wall, but was driven off. Interestingly, some of the intelligence the Chinese defenders were getting were provided by Chinese civilians on the southern bank. Witnessing Japanese maneuvers, they relayed the intelligence to those standing at the river bank, who made large posters of the intelligence information for the Chinese soldiers inside the warehouse to read. ww2dbaseBeginning at 0700 hours on 30 Oct, the Japanese displayed a show of heavy firepower against the warehouse throughout the bulk of the day. After nightfall, floodlights were set up so that the bombardment could continue. On 31 Oct, surprising the defenders, Chiang gave the defenders the go-ahead to withdraw from the warehouse. As things had turned out, on 29 Oct western officials in the international zone submitted a plea for Chiang to give up the warehouse for "humanitarian concerns" at the face of overwhelming Japanese forces. Meanwhile, they had also approached the Japanese, who agreed that they would allow the Chinese to retreat through the international zone without interference. As the clock struck 12 during the night of 31 Oct-1 Nov, Xie and his remaining 376 men began leaving the warehouse. The Japanese, despite of the earlier agreement, opened fire on the withdrawing Chinese soldiers, which wounded ten. The retreat was completed around 0200 hours in the morning of 1 Nov. The Chinese soldiers were placed under British arrest until the start of the Pacific War in the international zone; the main reason for the arrest was so that Japan could not accuse the United Kingdom of siding with the Chinese. ww2dbaseAlthough the fight did not last until the start of the Brussels conference, Chiang believed that the defense of the Sihang Warehouse had achieved acquiring the level of publicity that he called for. Elated, Chiang promoted every defender by one rank, and Xie was awarded the Order of the Blue Sky and White Sun. After Xie's assassination in Apr 1941, he was posthumously made a lieutenant general. ww2dbase"[There] were 3,000 men in my regiment when the battle for Shanghai started," Yang Yangzheng, a platoon leader who fought at the warehouse, recalled. "When it was over, there were 300 left.... The battle lasted four days and five nights. We didn't get a minute of sleep". When the Japanese crossed Suzhou River and threatened to surround the warehouse, the remaining defenders finally withdrew. ww2dbaseThe fighting at Sihang Warehouse became the basis of morale-inspiring propaganda as early as 1938, providing much needed boost. ww2dbaseOn 5 Nov 1937, Japanese 10th Army (equivalent of a western corps in strength) landed in Jinshanwei, south of Shanghai, nearly unopposed due to Chinese troops' concentration near Dachang and other regions north of the city. With the city encircled, and not seeing any positive results out of the Brussels conference, Chiang finally issued a general retreat order on 8 Nov, and by 12 Nov the city was cleared of remaining Chinese soldiers. Japanese advances broke Chinese defenses at Kunshan on 10 Nov, the Wufu Line on 19 Nov, and Xicheng Line on 26 Nov. On 1 Dec, Japanese Army troops arrived near Jiangyin and captured the town on the following day; the coastal battery near Jiangyin fell on 3 Dec. Chinese Army would continue to fall back toward the capital city of Nanjing. ww2dbaseInitially, the Japanese predicted a victory over Shanghai in three days; the battle lasted three months. ww2dbaseThis battle was the first large-scale confrontation between the armies of Japan and China, and proved to be among the bloodiest. The greatest achievement of the Chinese was to inflict 40,000 casualties out of the 300,000 Japanese engaged and slowing the Japanese momentum. However, the achievement came at an extremely heavy price. The Chinese suffered 250,000 casualties out of 700,000 engaged, and worst of all, many of the casualties include the elite German-trained troops of the Chinese Army. The toll on experienced officers also had severe repercussions in subsequent events of the Second Sino-Japanese War. Politically, Chiang's position as the head of the Chinese republic suffered as a result of this loss, but the stubborn defense, despite the heavy losses, gave the international community some confidence in the fighting ability of the Chinese. ww2dbaseThe resistance that lasted three months also provided the Chinese time to relocate some industrial capability further inland. Though the amount of machinery actually relocated was insignificant, it provided the Chinese a minimal ray of hope that the war against the Japanese could be continued even at the loss of the major industrial region of Shanghai. ww2dbaseAfter the Japanese victory, the Japanese garrison in Shanghai was increased to 300,000 men. At that time, British civilians and military personnel, French civilians and military personnel, American civilians and military personnel, and Chinese military personnel (recall those imprisoned after Sihang Warehouse defense) in the International Settlement in the city totaled less than 8,000. When the Japanese came in Dec 1941 at the outbreak of the Pacific War, the international zone would be occupied by the Japanese without much of a challenge. ww2dbaseZhang Zhizhong, who ensured that the minor clashes escalate into a major battle at a quick pace, would rank among the most effective agents planted by the Soviet Union in China during the WW2 era. 7 Aug 1937 Chinese Navy began planning for the blockade of the mouth of the Yangtze River at Jiangsu Province, China. 9 Aug 1937 Chinese Peace Preservation Corps troops shot and killed Japanese Special Naval Landing Forces Lieutenant Isao Oyama as he attempted to enter Hongqiao Airport, Shanghai, China without authorization. 10 Aug 1937 Japanese Consul General in China demanded the Chinese to withdraw the Peace Preservation Corps from Shanghai due to the death of Lieutenant Isao Oyama at Hongqiao Airport on the previous day. Meanwhile, additional Japanese troops began arriving in Shanghai. 11 Aug 1937 Chinese trawlers Ganlu, Aori, and Qingtian and gunboats Suining, and Weining destroyed lighthouses, buoys, and other navigation aids at the mouth of the Yangtze River at Jiangsu Province, China to disrupt an expected naval incursion. On the ground, additional Chinese troops began arriving in Shanghai. 12 Aug 1937 Chinese light cruisers Hairong, Pinghai, Ninghai, Haichou, and Yixian and training cruiser Yingrui arrived at the mouth of the Yangtze River at Jiangyin, Jiangsu Province, China in anticipation of a Japanese attack. On the same day, 8 older naval vessels, 20 civilian transports, and 8 civilian barges were sunk in the river to block Japanese warships from entering. 13 Aug 1937 Japanese troops and men of Chinese Peace Preservation Corps exchanged small arms fire at the Zhabei, Wusong, and Jiangwan districts of Shanghai, China starting at 0900 hours, thus opening the Second Battle of Shanghai. At 1500 hours, Japanese troops crossed the Bazi Bridge in Zhabei district amidst mortar attacks by troops of Chinese 88th Division. At 1600 hours, warships of Japanese 3rd Fleet bombarded Chinese positions. 14 Aug 1937 Liu Zhesheng, flying a Hawk III fighter, shot down a G3M bomber of Japanese Kanoya Air Group near Shanghai, China. He shared this victory with fellow pilot Li Guidan or his wingman Lieutenant Wang Wenhua. 15 Aug 1937 Liu Zhesheng, flying a Hawk III fighter, shared the credit of a B2M aircraft from carrier Kaga with other pilots near Shanghai, China. He was forced to break off from the engagement after his aircraft was damaged in the fuel tank. 16 Aug 1937 Japanese aircraft attacked Chinese positions at Jiangyin, Jiangsu Province, China. 17 Aug 1937 Japanese light tanks halted a Chinese counter attack at Shanghai, China. Meanwhile, the first group of American evacuees departed from the international zone of Shanghai. 22 Aug 1937 In the morning, 12 Japanese Type 92 attack aircraft, escorted by 6 Type 95 fighters, attacked Jiangyin, Jiangsu Province, China, targeting light cruisers Pinghai and Ninghai. Pinghai suffered a hit in the forward half of the Pinghai the starboard side, causing light flooding and injuring commanding officer Captain Gao Xianshen in the waist; Ninghai also suffered one hit. At noon, another wave of Japanese bombers arrived from the west and dropped bombs from altitude, causing minor damage to Pinghai. In the afternoon, 7 carrier aircraft from Kaga attacked the Chinese fleet. At 1630 hours, 9 Japanese aircraft attacked Ninghai, causing no damage. At 1730 hours, 6 Type 92 attack aircraft and 3 Type 95 fighters of the Japanese 12th Air Fleet attacked Pinghai, causing further damage with four bomb hits and near misses. On this day, Pinghai suffered 5 killed, 23 wounded; she also claimed 5 aircraft shot down. Chiense training cruiser Yingrui was also damaged by Japanese aircraft on this day. 23 Aug 1937 Japanese reconnaissance aircraft scouted Jiangyin, Jiangsu Province, China at 1100 hours. At 1400 hours, 9 Type 92 attack aircraft and 3 Type 95 fighters of the Japanese 12th Air Fleet attacked Jiangyin with the purpose of drawing fire from the defenses; shortly after, 12 Type 94 bombers, 14 Type 96 bombers, and 8 carrier aircraft from Kaga attacked the primary target Chinese light cruiser Pinghai, scoring three bomb hits and sinking the ship in shallow waters. At 1400 hours, 38 Japanese aircraft attacked Ninghai from three directions, hitting the light cruiser three times, wounding Captain Chen Hongtai in the legs. Chen attempted to move Ninghai up river away from the action, but she gave in to her wounds near Bawei harbor, sinking by the stern in shallow waters. Ninghai suffered 62 casualties on this day, but claimed 4 Japanese aircraft shot down. 24 Aug 1937 Three Chinese transports and eight captured Japanese transports were sunk at the mouth of the Yangtze River at Jiangyin, Jiangsu Province, China, adding more obstacles to prevent Japanese navigation. 25 Aug 1937 Chinese light cruisers Haiqi, Hairong, Haichen, and Haichou were sunk at the mouth of the Yangtze River at Jiangyin, Jiangsu Province, China, adding more obstacles to prevent Japanese navigation. Later in the day, 16 Japanese carrier aircraft from Kaga attacked and sank Chinese light cruiser Yixian; two Japanese aircraft were lost in the attack. 28 Aug 1937 Japanese aircraft damaged Chinese gunboat Chuyou at Jiangyin, Jiangsu Province, China. 28 Aug 1937 Wang Xiaoting, also known as H. S. "Newsreel" Wong, filmed the scenes at South Station in Shanghai, China immediately after a Japanese Navy aerial bombing. One of the stills featuring an injured and crying toddler, "Chinese Baby", would soon be seen by an estimated 25 million people world wide in the form of newsreels, newspapers, and magazines by the end of the year. 29 Aug 1937 Japanese aircraft damaged Chinese gunboat Chuyou at Jiangyin, Jiangsu Province, China. 29 Aug 1937 Settsu, which had ferried a battalion of Sasebo 4th Special Naval Landing Force from Japan, disembarked the troops onto light cruiser Natori and destroyer Yakaze off Shanghai, China. 11 Sep 1937 Following the advice of German advisor to China Falkenhausen, Chinese troops dug in at Luodian near Shanghai to defend against a Japanese offensive. The 300,000 Chinese infantry troops would hold on to Luodian for four days against attacks by 100,000 Japanese troops with overwhelming firepower. 15 Sep 1937 Japanese troops took the town of Luodian near Shanghai after four days of attacks. 2 Oct 1937 Japanese aircraft sank Chinese gunboat Chuyou at Jiangyin, Jiangsu Province, China. 3 Oct 1937 Japanese aircraft sank Chinese torpedo boat Hupeng at Jiangyin, Jiangsu Province, China. 17 Oct 1937 The Guanxi Army arrived in Shanghai, China to reinforce the Chinese forces. 26 Oct 1937 At 2200 hours, the Chinese 524th Regiment withdrew from Shanghai North Railway Station into the six-story Sihang Warehouse in Shanghai, China. 27 Oct 1937 After taking Shanghai North Railway Station in the morning, Japanese troops moved on to launched a small scale attack the Sihang Warehouse on the north bank of the Suzhou River in Shanghai to test Chinese defenses. The Japanese avoided using mortars and other weapons of greater firepower, including aerial bombardment, to avoid hitting the international zone just across the river. 28 Oct 1937 Japanese troops attacked the Sihang Warehouse in Shanghai, China with light field guns. In the evening, trucks loaded with donated supplies from Shanghai residents reached the warehouse; Japanese snipers killed three Chinese soldiers while they were unloading the trucks. 29 Oct 1937 A 12-foot-wide Chinese flag was raised atop the Sihang Warehouse in Shanghai, China, which was a great morale booster for the defenders fortified inside the building. Meanwhile, western officials in the international zone in Shanghai appealed to Chiang Kaishek to order the defenders in the Sihang Warehouse to withdraw, while negotiating for a short ceasefire agreement from the Japanese so that the withdraw would be conducted in peace. 30 Oct 1937 The Chinese coastal battery at Wushan, Jiangsu Province, China sank two Japanese Navy vessels. 31 Oct 1937 At midnight, the remaining 376 Chinese officers and men in the Sihang Warehouse in Shanghai, China withdrew from the building into the international zone. The evacuation was completed by 0200 hours on 1 Nov 1937. 1 Nov 1937 The Sihang Warehouse in Shanghai, stubbornly defended by the Chinese for four days, was evacuated between 0000 and 0200 hours. The 376 Chinese officers and men were allowed to evacuate into the international zone across the southern shore of the Suzhou River but were kept imprisoned until the outbreak of the Pacific War in 1941. 5 Nov 1937 Japanese 10th Army landed at Jinshanwei in the south of Shanghai, China in an attempt to surround the city. 8 Nov 1937 Chinese troops began to retreat from Shanghai, China. 9 Nov 1937 Japanese troops began the occupation of Shanghai, China. 1 Dec 1937 Japanese troops landed near Jiangyin, Jiangsu Province, China. 2 Dec 1937 Japanese troops captured Jiangyin, Jiangsu Province, China. 3 Dec 1937 Japanese troops captured the coastal battery near Jiangyin, Jiangsu Province, China. Great read, I am looking for info on chinese battles during world war two. Do you know where I can find information? I think you can find enormous information on the Wiki(http://en.wikipedia.org/wiki/Wiki). I always reading the histories of World War Two there. I was on guam as a marine and searching the manny caves I found a Japanese red ball flag with a artilery gun drawen on it . there is a lot of writing on it. the first battel was I n china in 1936.the flag is 27 inches by 38 inches. the writing is getting dull but the last time anything is written on it was orders for the flag was canceled Dec the 6th 1941. If I knew how to send you pictures on the computer I would. jesse j williamson 1841 holub lane Antioch ca. By the way I turned 18 on Dec.7th 1941. Great information but quite a few grammatical errors that should be checked before publishing on the web. That's a great story. Where did you read about Lee Paokui? Chen Nan and Lee Paokui are my grandparents.